Throughout an illustrious career that spanned the half-century from the Spanish-American War through World War II, Benjamin O. Davis proved that determination and diplomacy could overcome the barriers raised by racial bigotry. Today there are as many as 10,000 black officers in the army. In Davis's day there weren't more than two or three. 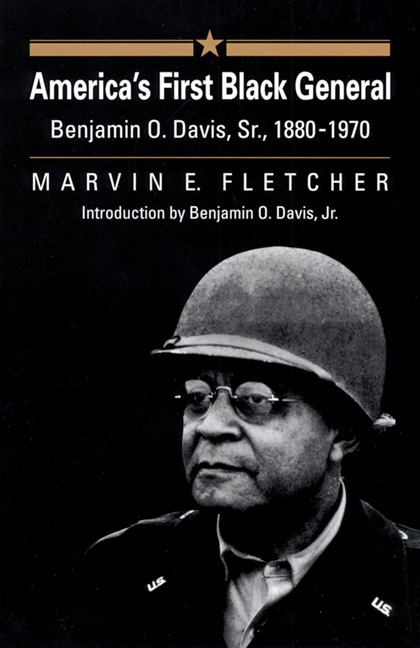 As Marvin Fletcher's admiring but balanced portrait shows, this enormous change owes not a little to the persistent efforts and quiet dignity of Benjamin O. Davis. Davis helped "lay the foundation for the integration of the armed forces, the first major break in the wall of segregated America." Born into the black middle class of Washington, D.C., Davis maintained a lifelong love for the military, despite the debilitating effects of the army's segregation policies. Such policies repeatedly denied Davis promotions and meant " safe assignments"—Liberia, Tuskegee Institute, Wilberforce University—designed to keep him from commanding white troops. It took thirty years from his enlistment until his promotion to colonel, and another decade before he became America's first black general. Promoted to brigadier general at the start of World War II, Davis headed a special section that monitored black military units at home and overseas, investigated an increasing number of racial disturbances, and bolstered the black soldier's morale. He was largely responsible for persuading the Army to try a limited form of integration. The success of that effort led to a federal mandate for the integration of the entire American armed forces.